Last night on the red carpet for X-Men: Days of Future Past in London, executive producer Lauren Shuler Donner confirmed that Channing Tatum will join the rest of the X-Men as Gambit. The rumors are confirmed. Channing Tatum to take on the role of Gambit. "It's Channing," Donner told TotalFilm. "He's a rogue, Channing. He's a rascal, just like Remy LeBeau, and he can handle the action, we all know that. And he's got a real good heart, I know him personally." She added, "He'll be great for Gambit, and he's a southerner, too…he understands that world, and you know Gambit loves New Orleans." Rumors of Tatum taking on the role of the card-dealing Cajun have been milled about since September, when according to Slash Film, the 21 Jump Street and Magic Mike star claimed Gambit was the superhero he would most like to play during an interview promoting White House Down. "I would like to play Gambit. Gambit's my favorite. I'm from New Orleans, around that area. My dad's from New Orleans, and I like to do a Cajun accent. I could do it for real. No knock on Taylor Kitsch, though, 'cause I actually like his Gambit, but I've always lived around Cajun people. [...] Gambit was always like the woman-loving, cigarette-smoking, drinking [guy]. He was the punk rock of all the superheroes. He's a thief. He kind of rode the line." X-Men: Days of Future Past opens on May 23. X-Men: Apocalypse is set for a May 27, 2016 release. 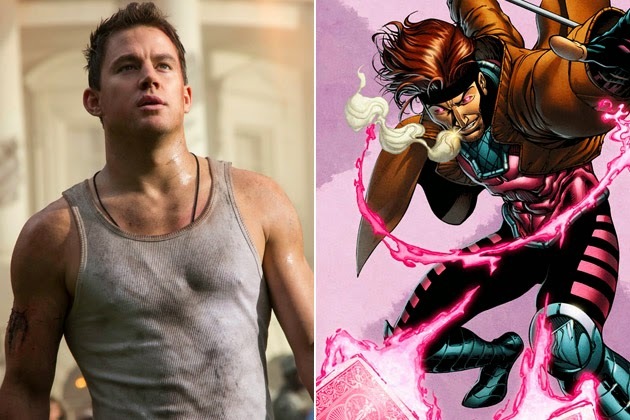 What do you think of Fox's decision to cast Channing Tatum as Gambit? Do you think Magic Mike can handle the role? Are his claims of childhood affinity for the character genuine or is he just pandering to the fans? Sound off in the comments below!